Science fiction means different things to different people. For some, it’s the quasi-fantasy/space opera of Star Wars. For others, it’s allegorical space-faring material like Star Trek. And for still others, it encompasses a strongly technical, scientific, and/or visionary aesthetic. Annihilation, like Alex Garland’s previous endeavor (and directorial debut), Ex Machina, falls into the category of films that embrace Big Ideas in ways that presuppose viewers are intelligent and attentive. Is that asking too much from the average movie-goer? Annihilation is to genetics as Ex Machina is to robotics although the films are related only in their lack of conventionality and willingness to challenge audiences. Liking Ex Machina is no guarantee of liking Annihilation or vice versa. In terms of tone, Annihilation is a close cousin to Arrival. There’s the same dark atmosphere and bleak sense of discovery. 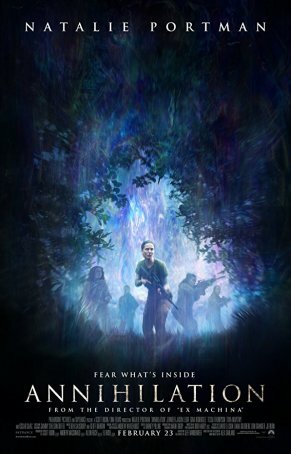 Annihilation has its share of action – including one horrifying encounter that ratchets up the tension to an almost-unbearable level – but this movie, unlike something produced for mass audiences, is about what happens in the calm moments between the loud, splashy sequences. I often find non-linear narrative structures to be lazy and unhelpful except in cases where there’s a story-based reason for it, which is the case here. Annihilation opens with a woman, Lena (Natalie Portman), being questioned by a man wearing a decontamination suit. Her memory is vague – she is unable to give clear answers to simple questions. We follow her story through a series of flashbacks with Garland frequently jumping around in time, back and forth, forth and back, as it suits his method of storytelling. In the past, we meet Lena a year after the disappearance and presumed death of her husband, Kane (Oscar Isaac). She’s emotionally closed-off and his sudden, unheralded return shocks her to the core. She’s painting a bedroom and, turning when she hears a noise, sees him in the hallway. But there’s something wrong with Kane. He’s cold and emotionless. His dialogue consists of mumbled answers and half-phrases. Then he starts to bleed from the mouth before going into convulsions. The government whisks him away and Lena with him. She soon learns that he was part of a super-secret group of volunteers who entered a mysterious area called “The Shimmer” (aptly named for the nebulous curtain around the perimeter). Despite being the sole survivor, his condition renders him unable to provide any useful information. Another party is going in and Lena petitions to be included. There are five of them – all women and all highly educated except one. In addition to Lena, a biologist, they are: Dr. Ventress (Jennifer Jason Leigh), a psychiatrist; Anya (Gina Rodriguez), a gregarious paramedic; Cass (Tuva Novotny), a friendly anthropologist; and Josie (Tessa Thompson), a shy physicist. The enter The Shimmer hoping to unlock its mysteries and find a way to retard its expansion. They are armed only with some guns and their intelligence. To survive, they will need both those things – and perhaps more. Discovery is an important part of the journey that Garland takes the viewer on. The movie makes us an invisible member of Lena’s group; a mute presence on her shoulder. We learn only what she learns; we see only what she sees. Like her, we sometimes have to fit together the pieces of a puzzle – the screenplay doesn’t do it for us by force-feeding the answers. To the end, there’s a layer of ambiguity. The final scene can be interpreted in various ways.